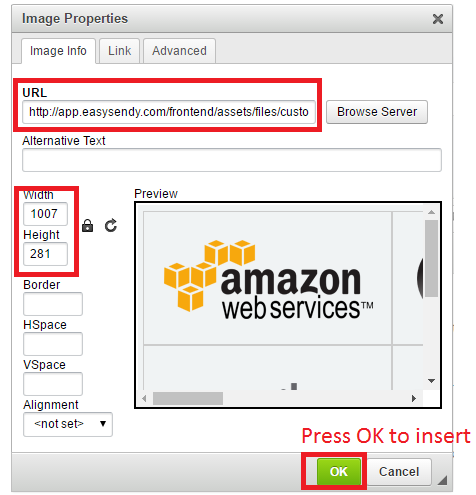 You can easily add images into your email template inside EasySendy Drip (or EasySendy Pro) email template editor. 1. To upload the images to your email inside email template, click “Create new Campaigns” (you can also choose your own campaign in which you want to add images) under “Campaigns” menu of EasySendy Drip (or EasySendy Pro) dashboard. 3. On next screen, when you get WYSIWYG email template editor select “Images” option from the content board. 4. A pop-up will appear, click on “Browse Server” option. 5. 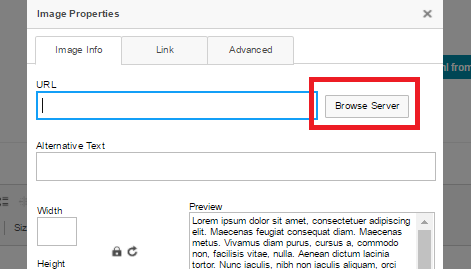 Select the image (which you want to upload), you can “Drag and Drop” the images in this window to upload then you can “Double click” on the image to insert it into the editor. 6. Now, adjust the alignments such as width ,height, border, update the URL accordingly for the image. 7. Finally,click on “OK” button to upload the image. 8. You can see the image have been uploaded and now you are ready to send email campaign.